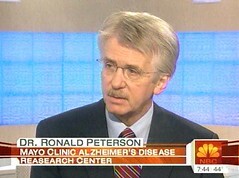 Dr. Ronald Petersen, a Mayo Clinic neurologist, was on NBC’s TODAY show this morning discussing prospects for a cure of Alzheimer’s Disease. This is part of a TODAY series on how far medical science is from cures for various diseases. Research from several other institutions was featured in the set-up piece, and Dr. Petersen, who was President Ronald Reagan’s physician, provided the overall perspective as the in-studio guest with Matt Lauer. Dr. Petersen leads the Alzheimer’s Disease Research Center at Mayo Clinic and has extensive on-camera experience, both live in-studio and satellite interviews with broadcast networks as well as taped interviews for produced segments.